Police reported that four players from the Navy club and one from Nakhon Ratchasima were allegedly paid up to 200,000 Thai baht (US$6,100) to manipulate results. Football Association of Thailand president Somyot Poompanmuang gives a traditional Thai greeting at a press conference in Bangkok on November 21, 2017. Somyot said five players and two match officials from the top-flight national league were arrested for match-fixing. 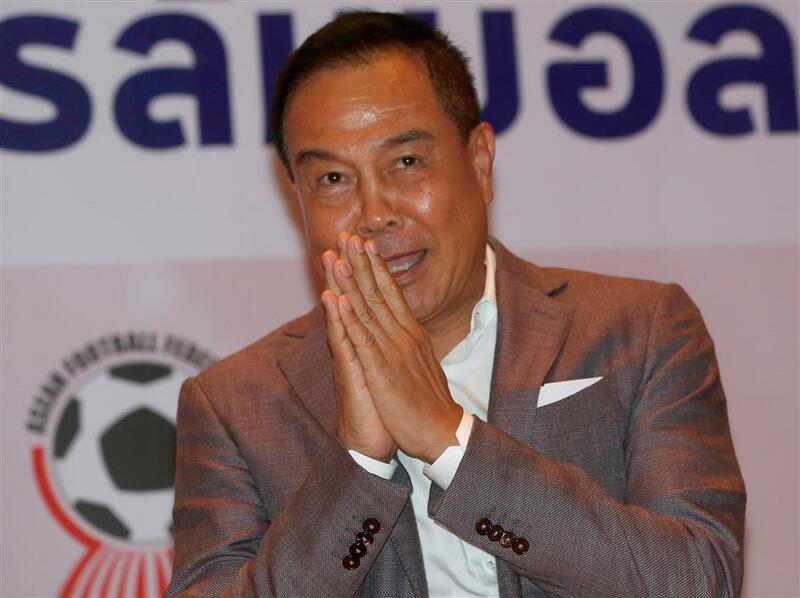 Football Association of Thailand president Somyot Poompanmuang says five players and two match officials from the top-flight national league are among 12 people arrested for alleged match-fixing. Somyot held a news conference in Bangkok on Tuesday with national police chief Chakthip Chaijinda to announce an investigation was under way into the results of a match in July and three matches in September. "Match-fixing has been committed for a long time," Somyot said during the news conference at the Royal Thai Police headquarters. "It's time we eradicate this wrongdoing which is like a bad disease of our body that needs to be cured." Chakthip said 12 people had been released on bail. Court details were not immediately available. "I have to give big credit to the Royal Thai Police for their work or otherwise we will see the fall of Thai football if match-fixing is not tackled," Somyot said. Thai league football was once notorious for match-fixing linked to gambling between mega-rich club owners and overseas betting syndicates that riddle Southeast Asian sport. But in recent years the league has professionalized, with rising TV income and match-day receipts boosting the profile of the domestic game while foreign players have raised the standard on the pitch.